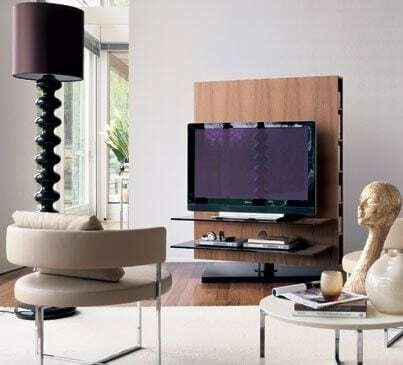 Turnable column with wooden panel for flat screens. Inside the unit is equipped with a multi plug for stroke, decoder, TV signal and phone connection. Tempered and clear glass shelves 12mm. Finishes: Canaletta Walnut, Canaletta Walnut Stained Moka, Natural Ash, Ash Stained Moka, Ash Stained Wenge, Matt Lacquered Open Pore – Several Colours Available. Metal: Matt Silver or Matt Brown. Glass: Clear, Frosted, White Lacquered, Black Lacquered. Turnable column with wooden panel for flat screens. Inside the unit is equipped with a multi plug for stroke, decoder, TV signal and phone connection. Tempered and clear glass shelves 12mm. Finishes: Canaletta Walnut, Canaletta Walnut Stained Moka, Natural Ash, Ash Stained Moka, Ash Stained Wenge, Matt Lacquered Open Pore – Several Colours Available. Metal: Matt Silver or Matt Brown. Glass: Clear, Frosted, White Lacquered, Black Lacquered. Dimensions (WxDxH): 1240x540x2480mm.